I pulled this map from Richard Florida's latest post on the Atlantic Cities. 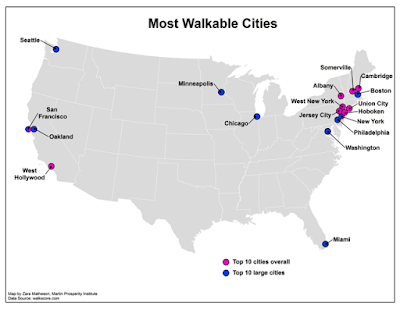 This map is his updated list of the top 10 walkable cities overall and the top 10 walkable large cities. Florida explains several correlations based off of this data, but I was particularly struck by the arbitrariness of the top 10 cities overall. Several small Gold Coast New Jersey and Boston area towns end up topping the list. Simply using municipal boundaries highlights the arbitrariness of these boundaries. These walkable cities are incredibly small and might as well be neighborhoods of New York City and Boston. I could think of a few ways to counter this. Florida himself measured MSAs and megaregions by looking at contiguous illuminated areas on a nighttime satellite picture of the US. Perhaps these regions can be used to get measurements of walk scores. Alternatively you could weight the walk score with size, so that smaller walkable cities don't end up beating larger cities that contain suburban fringes within their boundaries.